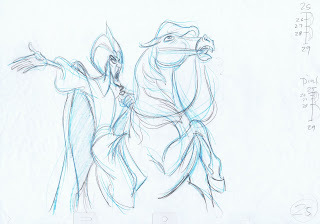 I always find it very impressive when someone has animated a human riding a horse. Beautiful! I don't know why but I find the horse's eye very amusing. 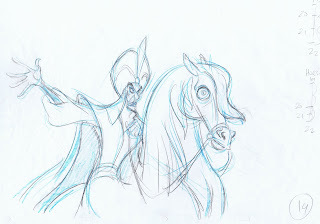 : D However, it gives a good contrast to Jafar's menacing eyes. As they say on Facebook: LIKE! 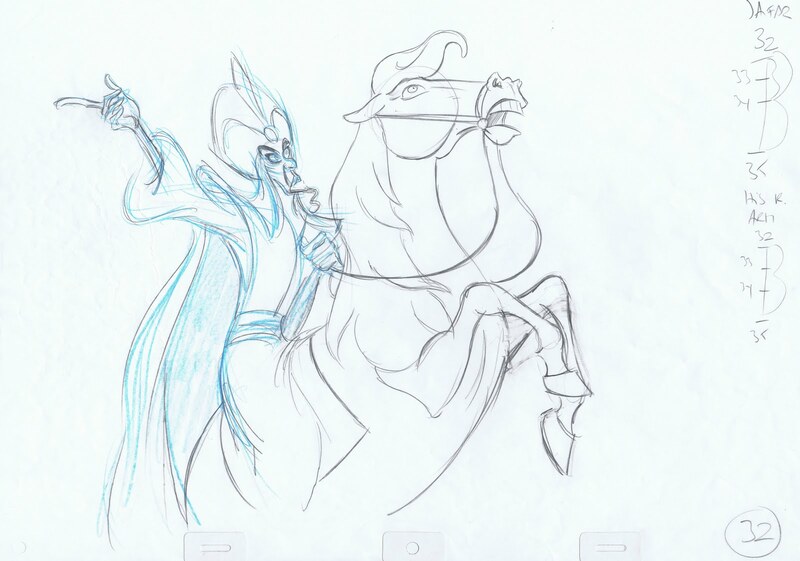 My favourite part is the stretch on the robes as they ride off. Wonderful. Boy do those frames fly past quickly! 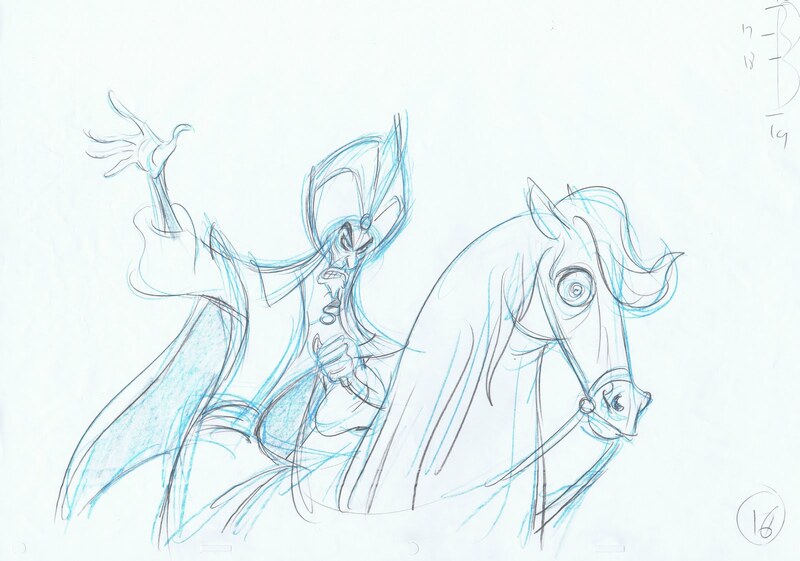 Laisanen mentioned the horses eye and while looking at the drawings I found myself wondering how well that was going to play in the final animation and of course when seeing it in the final... it is perfection. 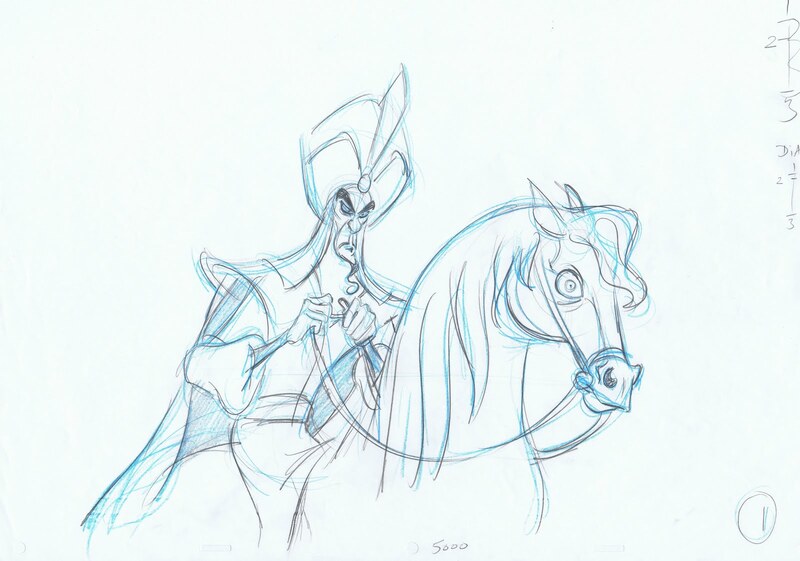 I suspect a novice animator might try to have the horse blink whereas there no reason or time for such a blink here? I remember the very first time I saw this on the big screen. I was 10 back then and it was TOTALLY trhilling for me. The merchant throwing the stars in the sky and starting to tell the story and then, this tall, dark, mysterious man totally won me over. 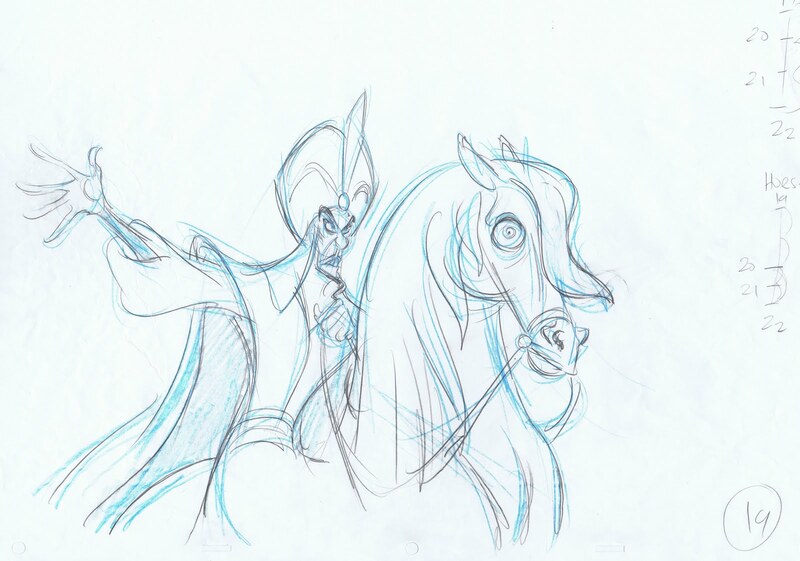 In Italy Jafar was dubbed by Massimo Corvo (who lent his voice to the Beast too). I adore the white eyes against the dark sky (was it intedended as an homage to Madame Tremaine? 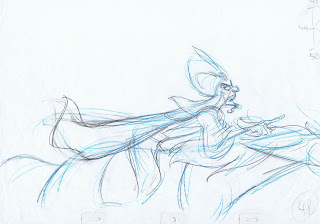 ), Jonathan Freeman's voice and is gestures. I'll never thank you enough for giving us this WONDERFUL character! So mannered, so theatrical! When this movie was released there was other evil animated vizirs (Dave Fleischer/Popeye's version of the Arabian Nights, Jack Kinney's one and Anton Gino Domenighini's La Rosa di Baghdad (The Singing Princess)"), not to speak of the villains from wonderful live action movies as "The Thief of Baghdad", "Kismet" or Ray Harrihousen's "Sinbad" Adventures . Still you gave the character something new, something fresh, making him modern. 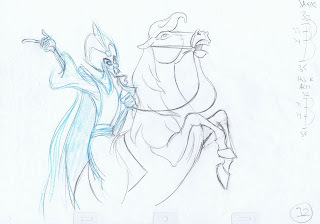 About that I wonder if Howard Ashman ever gave you indication about the character... PS from Cinderella's Midnight Chase, to this one, to Frollo's and Shan Yu's ones I was always fashinated by Disney dark tall horses! Considering that this was your first it's really amazing how forceful and vital it turned out to be. Congratulations! 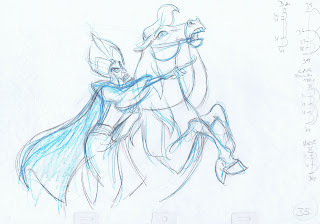 Andreas, is it true that Marc Davis once told you he liked your animation of Jafar? 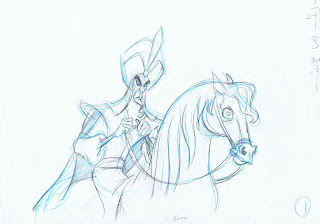 I love Jafar and I love your art! How do approach a shot like this Andreas? 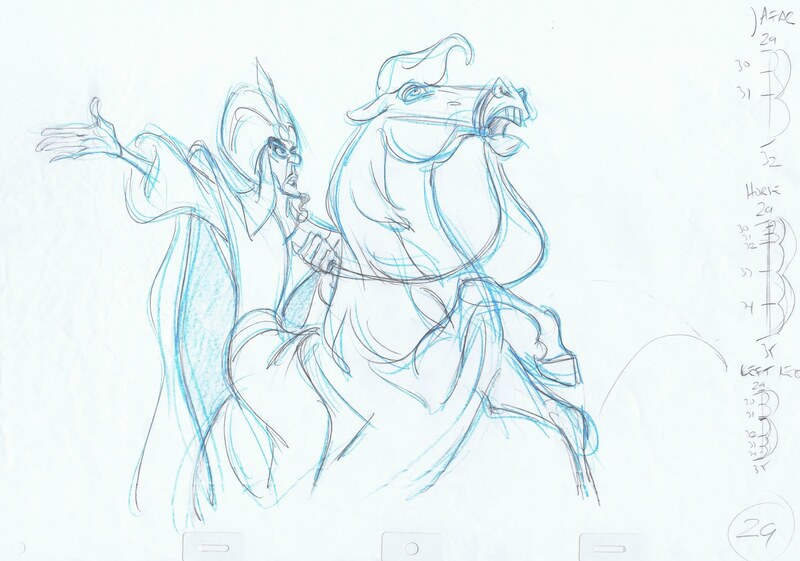 I mean, Jafar's motion is in part dependent on the horse's, so do you plan the horse first, or do you treat the two as components of the same character and handle the two at the same time? Thank you Andreas for posting these. Absolutely beautiful. This is also (as another reader mentioned) the scene that completely won me over when it came to this film. I saw it as a teenager and was completely engrossed in the film when this scene played. Thanks for showing these drawings. 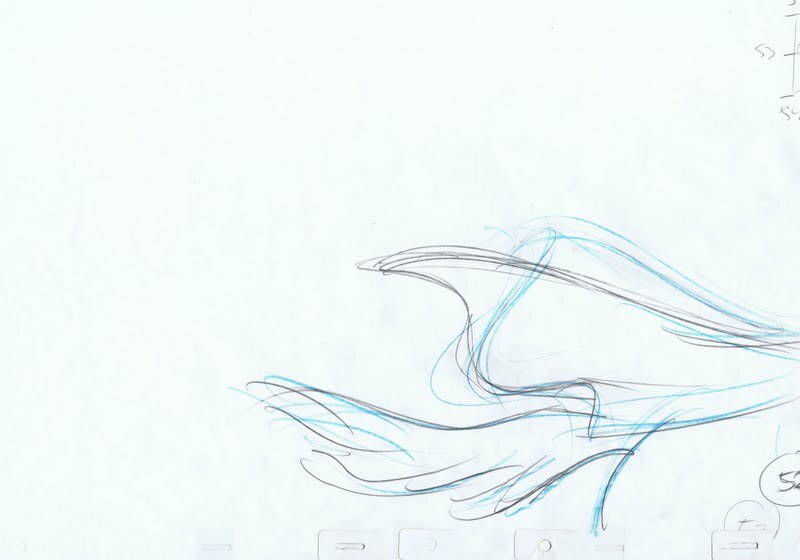 This post was really informative and inspiring for me as a young 2D animator. What I found most striking was that you used several timelines to dictate the actions instead of just one (which is what I usually do). Even though the scene only appears for less than 4 seconds, you put quite an amount of work into it. Thanks for sharing this. Do you use the blue pencil to get the drawings down then push the pose more with the graphite? I was just noticing how the cape is slightly different in the blue version compared to the graphite. sorry for being ignorant or something but i'd like to know how many drawings did this action need?..your key drawings plus all the breakdowns and inbetweens. It's always inspiring to see great work like this. Really keeps me going! Out of curiosity, all the mark-up on the side - is that like, a rough guide of your exposure sheet for you? You make some of the clearest timing charts on your drawings I've ever seen! Ive seen animation drawings where the charts are just indecipherable scribbles. Wonderful drawings! Also, how did you get him on that horse? It's very impressive as his design doesn't seem to lend itself to horseback riding! 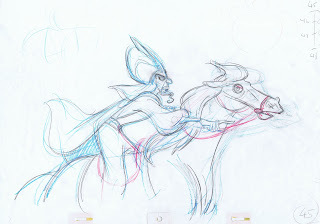 wow..each character has its own weight just from the spacing ( you can really tell the rider and the horse apart) love the flow and the build up of inertia (on the take off) that the feeling of urgency on his face still reads all the way to the last minute. I never had the chance to talk to Howard Ashman about Jafar. But I got very good material from the story guys and Jonathan Freeman. Yes, Marc did tell me he liked Jafar. 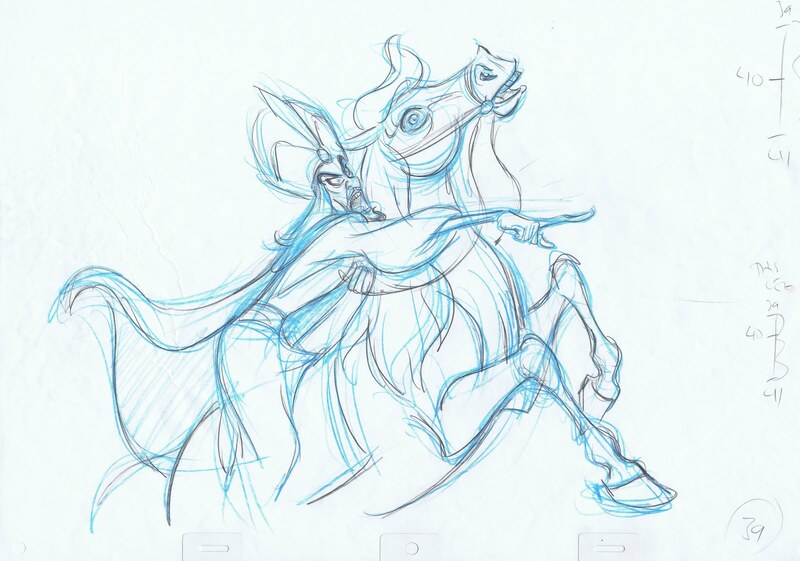 I did a drawing for Marc that showed Maleficent and Jafar together. I'll post about that later. I did animate both characters at the same time. I tried to avoid "twinning" their actions. 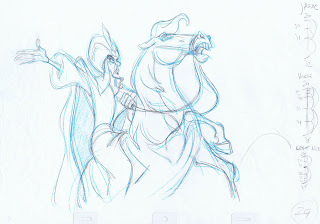 Horse rears up, Jafar points forward, then they take off. thanks for posting another gem of a song! the scene on top of the blue version. I still might make small changes. But this is the version clean up gets to work with, so I try to boil the drawings down and give them as much information as possible. the scene is on ones, it took a total of about 55 drawings. But as I mentioned, the beginning part was cut. Which works out better in term of pacing the sequence. those are charts. They indicate how many drawings are needed between two key drawings. They also inform the assistant about how to space them, right in the middle or favoring one or the other key drawing. how right you are. That's when we "cheat". thanks for putting the test together !! Very amusing! 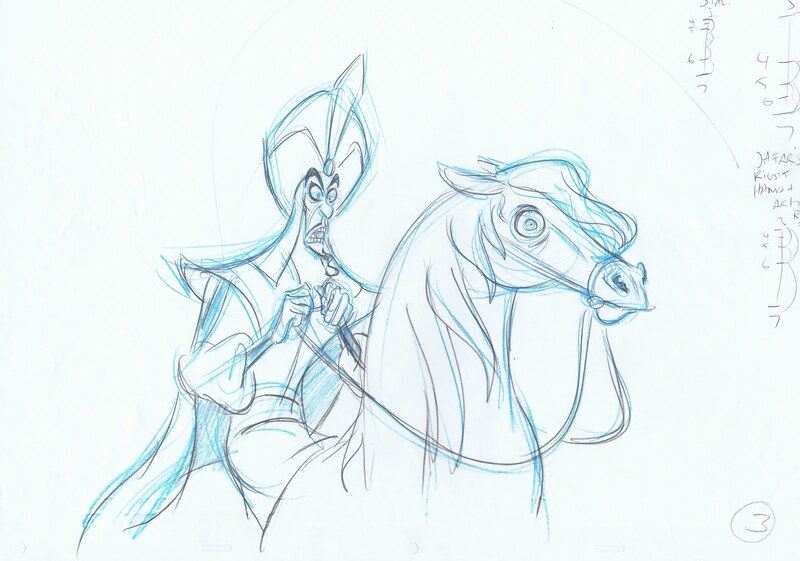 One of my favorite Jafar moments for sure. 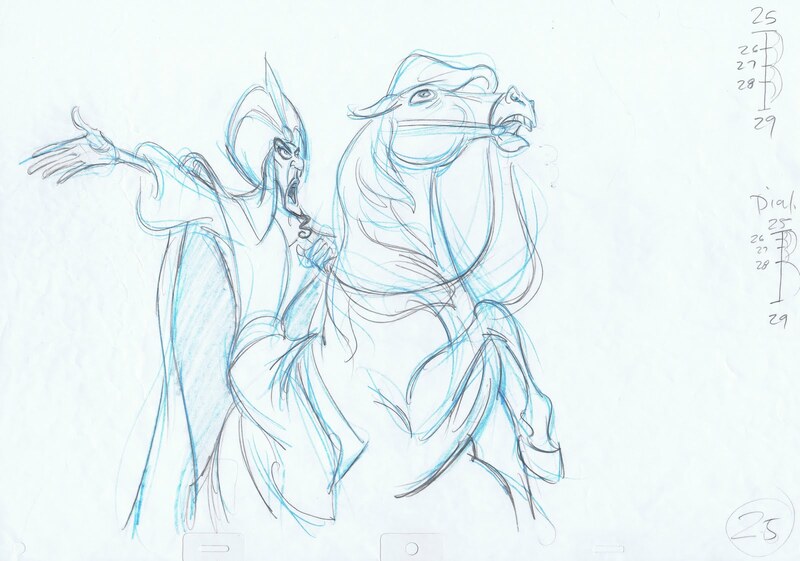 For most of my life, I wanted nothing more than to be an animator for Disney. 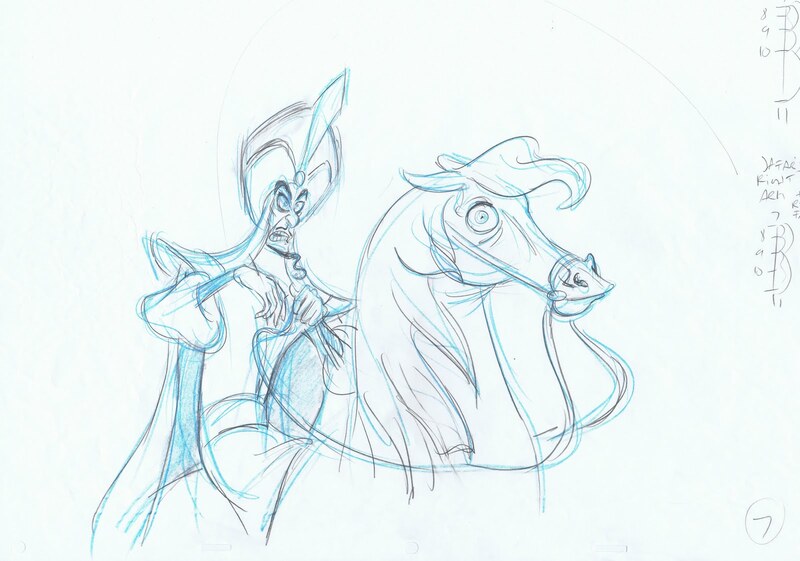 Unfortunately, I didn't have enough confidence in myself to pursue the art, instead I settled on working "for Disney" in various capacities at the theme parks and resorts. all I can say is, it definitely is NOT the same and I should have had more self esteem and confidence about my art when I was younger. Thank you so much for sharing your work with us. Aladdin is my favorite movie. I love how it starts of with a storyteller character that sets the tone of the movie then moves onto a scene featuring the villain of the movie rather than the hero. It's still kind of unusual compared to most movies to not start with the protagonist. Very cool. 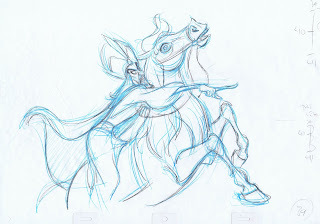 It feels like the use of the blue pencil first would make me loosen up to explore the pose. Mr. Andreas. 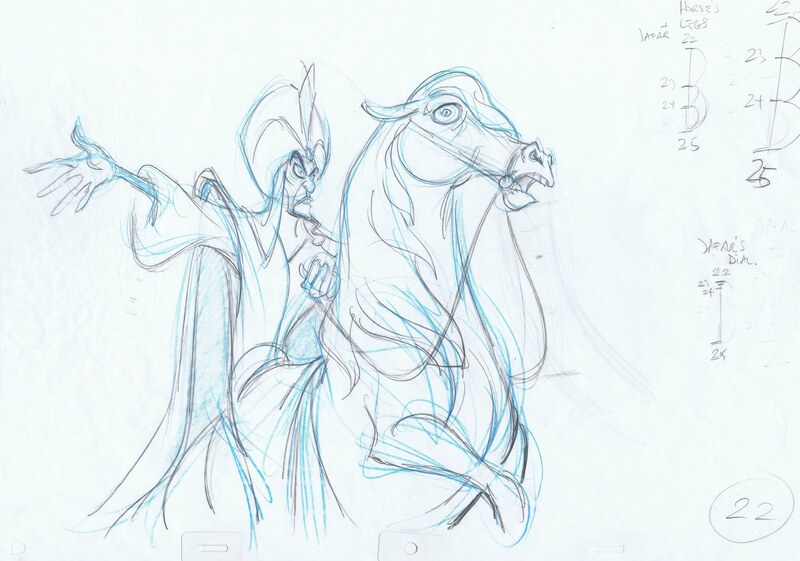 This is unrelated to the post, but I was wondering if you had any work featured in The Disney Sketchbook? If you do, do you have any idea when they will release it? 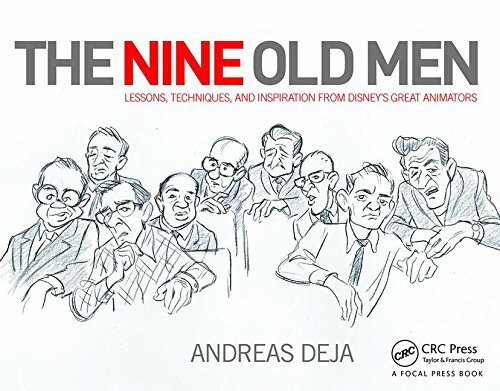 This book looked like it could be something amazing, but I haven't heard too much about it and Amazon doesn't have a proper release date. Anyway, if you have the time, any info would be really appreciated. Thanks. 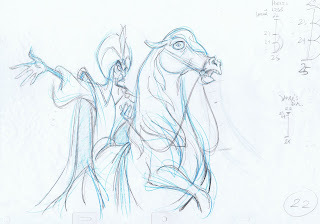 I don't know when the Disney sketchbook will come out, I'll try and find out. WOW!! thanks for the info Mr. Andreas! never thought you'd bother but i'll push my luck and press on for one more inquiries..im not really well informed in terms technique in traditional animation..but im very interested in learning it even for a bit..so please i hope you don't mind. I noticed the numbering in your drawings the first three drawings were numbered 1,3 and 7 and you told us that these are your key drawings so i'd like to know why did you number them as such?..you said that all in all the action required 50 drawings so im guessing that your numbering of the key drawings (1, 3 and 7) were based on the timing of the action? 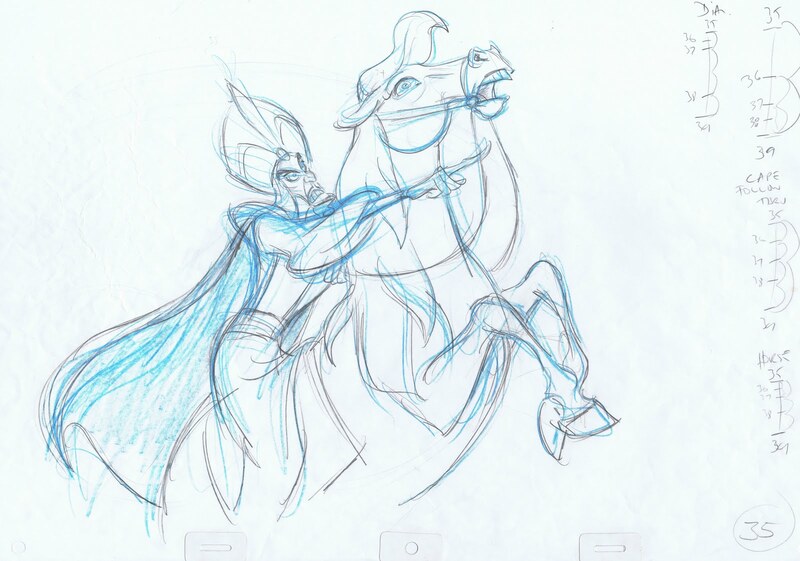 so drawings 2, 4, 5, and 6 were just inbetweens?..and were drawn by an assistant animator? I have watched Richard William's masterclass video and he said that for animators to have ironclad hold of their scenes they should outnumber the inbetweens by drawing added breakdown drawings. So based on that i'd like to know these drawings you posted are just keys and there are still breakdowns that you didn't post perhaps a breakdown between drawing 3 and 7?.. Im not saying that you and richard williams have the same method but im just pointing out his way so that you can clear up something that i might have misunderstood..god i think i just messed up my question..lol! but thanks all the same mr. andreas! you're one of the best! Iti is perfect and very nice to see how you animated. A watched The Lion King in 3D last friday, in Brazil, and I remember you when Scar appeared on the big screen. I miss so much that time when the 2D was once a year on the big screen. Ahhh.. I forgot it! When you can, please, post e tell us something about Hercules. I love your animation on this movies. 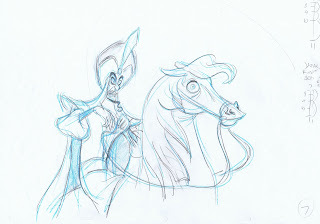 Jafar has always stood out in my mind as my favorite villain! Thank you so much for sharing these! I was just wondering did you shoot reference for this shot?